Lot 14978, Batu 5, Jalan Nenas, Off Jalan Kebun, 42450 Klang, Selangor, Malaysia. 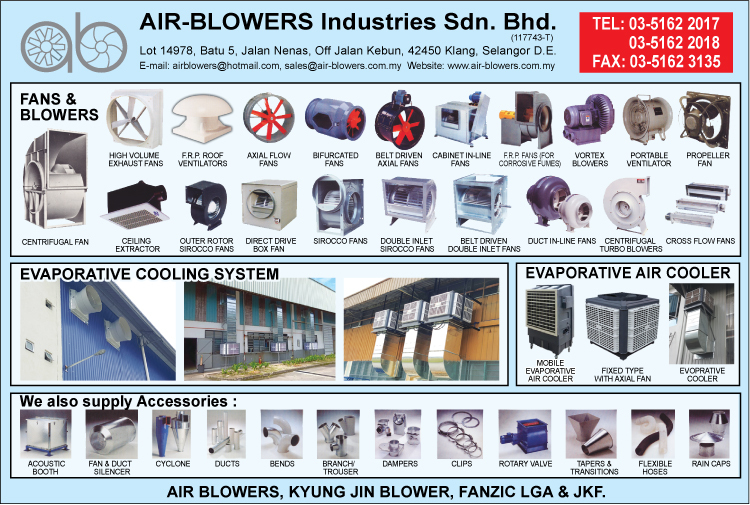 Air-Blowers Industries Sdn Bhd is situated in Shah Alam, one of the largest industrialize region in Malaysia. 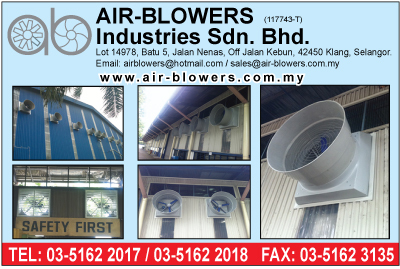 Strategically located near Port Klang the nation's largest port and only about 40km away from the Kuala Lumpur International Airport, Air-Blowers is able to efficiently supply and service its customers both locally and internationally. The combination floor space of 10,000 sq.feet comprising our office, warehouse and workshop enable us to adequately serve and meet our customers' demand. Among the range of equipments we produce in our in-house facilities are the “ AB Axial Flow Fans”, “AB Axial Bifurcated Fans”, “AB FRP Roof Extractors”, “AB Cabinet Fans”, "Big Volume Exhaust Fans" and the medium size Centrifugal Fans. Besides the above range of equipments, Air-Blowers also works together with other fan manufacturer to further complement its products range. In our quest to effectively service and provide our customers with more options and alternative product range, Air-Blowers also works together with overseas partners from countries such as Korea, Australia and United Kingdom to provide customers' with innovative air-moving equipments that incorporates leading edge technology. 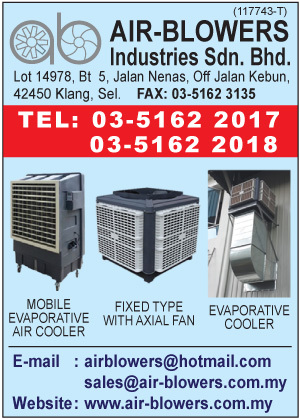 In Malaysia, we are supported by an extensive network of dealers and distributors making it easy for local customers in remote areas to gain access to our products and services. Our team of qualified staff is forever dedicated towards maintaining customers' satisfaction in our pursuit of excellence.